Gouache lettered on an Indian (we think) handmade paper that contains Marigold and Rose petals, using modern versal, uncial, and Neuland hands, written freehand on untreated paper so that the letters often have a rough texture from the petal surfaces. 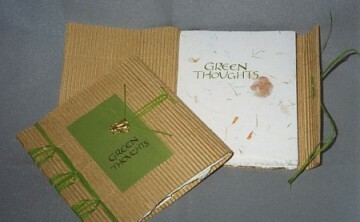 Corrugated brown Kraft paper and green Canson MiTeintes cover, bound with a Japanese edge sewn binding called Tortoise Shell Pattern, using dyed raffia grass. A touch of gold is provided by Sumi Gold/Red-Gold. The gold bee is a novelty button. Book 6¼" x 6¼" (15.9cm x 15.9cm).